The popular Business Suite has just been promoted! Now these business tycoons have twice the poses for your storyboards! In addition to the standard six Quick poses (stand, walk, run, jump, sit, prone), Mr. and Ms. Business are now available in three elevations and eight rotations of the six exclusive Quick Studio poses: phone, point, fight, drive, type, and lounge. When you need all your business people—from executives and paper pushers—to get down to work and get your project into production, these are the characters for you! These poses are perfect for the work place, with phoning and typing in the office, pointing during a presentation, and even driving on the commute to the city. The extended Studio poses of the Business Suite Studio are sure to give extra depth to your pre-production vision! Mr. and Ms. Business are flexible enough to represent a full cast of office mates with color customizable features! Choose the color of their hair, skin, and lips to create many different characters; you can even customize Mr. Business’ jacket, pants, and shoes and Ms. Business’ jacket, skirt, and heels! When you’ve chosen your custom colors for Mr. and Ms. Business, you can save your characters for future use by naming them and adding them to StoryBoard Quick Studio or StoryBoard Artist’s My Characters palette. The Business Suite includes libraries of Props to stock your office with just the right supplies! Detail your storyboards with the Props worthy of your top dog corporate executive, or the lowliest cubicle dweller. From desks to Rolodexes and secretary chairs, or break room coffeemakers to office printers and red Swingline staplers, you’ll find the right accent for the basement cubicle or the coveted corner office with a window. The Business Libraries include exteriors and interiors for the business person’s commute, workday, and lunch break! All the everyday views of your project’s metropolis are included and ready for shooting in this full-featured suite. Carry your briefcase onto the subway train, take a stroll through the city park, and walk (with purpose!) up to the doors of a windowed skyscraper, ready to take on another day of conference calls and paper pushing. The phone, point, fight, drive, type, and lounge poses aren’t confined to regular characters any longer! 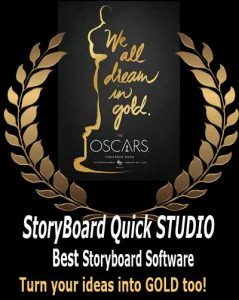 Get the extended Business Suite Studio in your copy of StoryBoard Quick Studio or StoryBoard Artist today! Click here to read more about the extended Business Suite Studio! Do you already own the Business Suite? We offer discounted pricing for upgrading your Add-On Suite to a STUDIO version. Check out the upgrade pricing for Business Suite Studio today!